"Under a 'clean money' strategy, which Finance Minister Eveline Widmer-Schlumpf is expected to present to the cabinet on Wednesday, banks will be obliged to get foreign clients to declare they are compliant with their home tax regimes." Let's be clear about what is going on here. Some clients of Swiss banks have money parked there legitimately, with all relevant assets and income declared to their home authorities as appropriate. But lots of them have stashed their cash there to evade tax (and to do other nefarious things). So as regards the 'clean money' strategy, the relevant people are those who have already taken the formidable step of lying to their home tax authorities. This measure merely gets them to lie again - but this time, only to Swiss banks. 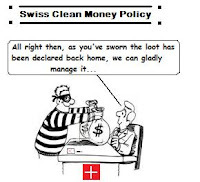 Lying this time will be far easier: the Swiss banks, unlike their home tax authorities, have no incentive to police these 'declarations', and there will be no penalties (apart from being subjected to potentially irritating nudging and winking from the bankers). The plan falls short of measures desired by left-wing Swiss politicians to require bank clients to prove taxes had been paid. At least some people in Switzerland have noticed what a charade this is. Now if those plans of those on the left were ever to come to anything: well, then we would start to sit up and take serious notice. Of course Swiss bankers have poured derision on this one proposal that would constitute a genuine move for transparency. "As a bank ,if you have a client give you money you have to trust and believe them...You can't be responsible for whether clients have paid their taxes," said Thomas Sutter, spokesman for the Swiss Bankers' Association." "Ha ha ha ha useless. Force tax evading criminals to swear that they are not tax evaders - otherwise they won't get a choccy with their coffee during their next visit to the bank vault. You couldn't write this fiction if you were Mickey Spillane." To get a true understanding of what the Swiss are doing, read the first sentence of this. For non-English speakers, this is a fairly common term, and was used to powerful effect by Barack Obama in 2008, severely annoying Sarah Palin and other critics. Also, the Swiss have just published their new financial centre strategy. Only the release is available in English. Die ganze Debatte ist scheinheilig. Anonymous, you are right - there is lots of hypocrisy involved, and indeed we did rank the United States the world's biggest tax haven in our 2009 Financial Secrecy Index, as the story you mention cites. Of course there is a lot of hypocrisy. Britain is terrible too, as we have said on many occasions. But that does not absolve Switzerland. And for the record, our methodology changed in the 2011 index, largely because the 2009 index gave too much emphasis to the scale weights as opposed to the secrecy score, meaning that a big change in the secrecy score made relatively little difference. And the result, using the new methodology, had the world's biggest tax haven as . . . Switzerland.